Does your house have foundation problems? Whether you’re a homeowner or just sizing up a home to buy, a faulty foundation can be dangerous—and expensive. Fortunately, though, that’s not always the case. 1. Did a crack appear all of a sudden? Most houses do some amount of settling over time, but large, sudden changes are not usually a good thing. “Some cracks are normal, but if big ones suddenly appear, that’s a red flag,” says Lesh. Yikes! 2. What does the crack look like? The type of crack can also tell you if it’s a problem or not. Hairline cracks in the mortar between concrete blocks are probably not worth calling a structural engineer for. Cracks in the mortar joints that look like stairs are a cause for concern, especially if the cracks are wider than a quarter-inch or if the wall is bulging. Horizontal or jagged 45-degree cracks are the most serious and usually indicate you will need professional help (and, potentially, a new foundation). 3. Are there any cracks that won’t go away? 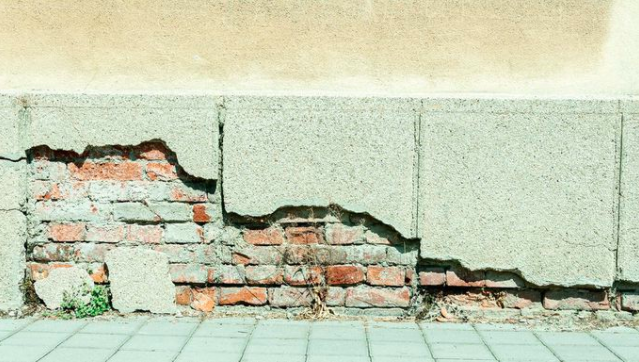 If a crack expands beyond an eighth of an inch and doesn’t close itself up (or even gets bigger), that’s an indication of a more serious foundation issue. 4. Do the doors and windows have trouble closing? A single door or window that’s on the fritz isn’t necessarily a problem, especially in humid areas where wood expands. But if the doors and windows on one whole side of your house suddenly won’t close all the way, well, that’s a bad sign. Look for cracks in the wall around doors and window frames—that’s another indicator that something has suddenly shifted. 5. Do you see any cracked tiles? There are lots of reasons that floor tiles can crack, but if you’re seeing more than just a single broken tile, or a crack appears along the floor one day, that could mean that your floor is suddenly not level any more. OK, so you’ve got some cracks you’re not happy about. Perhaps you’re feeling the urge to throw open your window and scream, “Why has this happened to me?” Well, here are some reasons your foundation might be less than perfect. Differential movement: “Differential movement is caused by widely varying moisture levels around or underneath your foundation,” explains Black. When you have wet patches and dry patches of soil, wetter areas expand and push upward while dry areas sink, causing upheavals. The most common culprit is improper drainage around your house. Either your gutters aren’t dumping water far enough away from the foundation, or the ground isn’t sloped for “positive drainage” (water going away from the house, instead of toward it). Flooding: Flooding—whether from a burst pipe, sewer leak, melted snow, or just too much rainfall—can cause wet soil to push up against the foundation, creating cracks. Improperly prepared soil: If the soil beneath your slab foundation wasn’t prepared correctly, as the weight of the house compacts it, parts of the foundation can settle and crack. This is especially a problem if there are several types of soil that compact differently, creating an uneven surface. Frost heave: Freezing and thawing causes water molecules to grow and shrink, making the soil beneath your home push up and contract back, eventually causing cracks. Changes to nearby ground: If you live in a city, construction near your home can jar your foundation. Someone digging out a new foundation next door can cause yours to shift if it’s not properly braced. In the suburbs, heavy machinery (like a cement truck) on a driveway alongside the home can cause the ground beneath to compact, shifting the foundation as well. What will it cost to fix foundation problems? The amount of money you’ll have to pay to fix your faulty foundation will, of course, depend on the cause and severity of the problem. Your first move is to find a structural engineer or contractor with foundation experience to give you a diagnosis. The average price range is $1,900 to $6,000, according to HomeAdvisor, though it’s extremely variable, depending on your problem, type of foundation, and where you live. The fix could be as simple as a contractor injecting epoxy into your wall to strengthen it, a procedure Lesh estimates costs around $50 a square foot. Or, you could be looking at a much more extensive repair to shore up the issue.